The Newest Rant: See Me at the Age of Adventure Comic Book Show this Sunday! 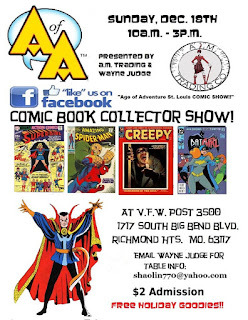 See Me at the Age of Adventure Comic Book Show this Sunday! What are you up to this Sunday, December 18th, 2016? 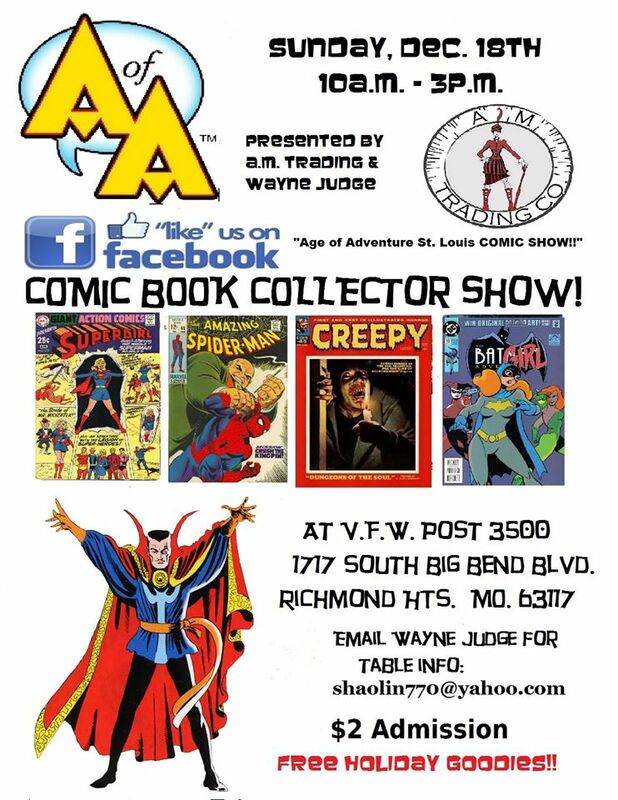 If you live near the Saint Louis area you should come to the Age of Adventure Comic Book Show! I will be there selling a large number of comics for a dollar as well as trade paperbacks and hardcovers. My collection has simply grown too big so I'm hoping to sell-off a bunch of stuff and clear-up space at home. Should you live in or be visiting the region you can come to the event by visiting the V.F.W. Post 3500 found at 1717 South Big Bend Boulevard, in Richmond Heights, Missouri, 63117. The show starts-up at 10AM and goes until 3PM so you'll have plenty of time to look-through all great stuff available for purchase. I also want to thank one of the show's sponsors, AM Trading Co. (a store I've discussed before), for mentioning the show to me as an opportunity to sell my stuff! It's only two dollars to get in and food will be for available in exchange for donations to the VFW so why not come by, say hello to me, and perhaps buy some of my stuff as well as other seller's goodies?